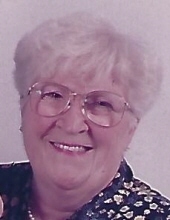 Patricia Josefosky, age 90, October 25, 2018, of Garden City. Beloved wife of Ernest. Loving mother of Karen (the late Gary) Wolvin, Charles (Cynthia) New, Katie (Dale) Maschke, Kevin Mackenzie, the late Melissa Mackenzie and John (Laura) Mackenzie. Also survived by many grandchildren and great grandchildren. She was preceded in death by her brother Frank Connelly. City. Funeral service Monday at 11am (instate at 10am) at the funeral home. Patricia was a person who loved her family dearly. She cherished camping with her family. Patricia was a member of the Water Aerobics Class at Fitness USA. Her family suggests donations to the Alzheimer’s Association. To send flowers or a remembrance gift to the family of Patricia Josefosky, please visit our Tribute Store. "Email Address" would like to share the life celebration of Patricia Josefosky. Click on the "link" to go to share a favorite memory or leave a condolence message for the family.